I’ve been reading this year’s results [pdf] of UCISA’s annual TEL survey and wanted to jot down a few of the things that jumped out. The key change though since 2012 is in the level of senior management engagement with TEL development. The 2014 case studies reveal that senior managers are now driving TEL development and are setting expectations for the adoption of tools by teaching staff. I’ve frequently found that one of the barriers to the development of TEL is the lack of interest in it from senior management – whether this is reflected in ignoring it or only paying lip-service to it. With so many balls in the air it isn’t a surprise when staff don’t engage with TEL for their myriad reasons – so it is essential that senior management recognise its importance and correctly resource and drive TEL development. One notable change in 2014 is the more frequent mention by institutions of cloud based hosted services […] Northampton and Glasgow Caledonian have taken the decision to opt for outsourced provision of their VLE platform, reducing the level of central technology support that is needed to run their centrally supported systems. I’m a strong proponent of SAAS and PAAS, but I’m not clear here whether this refers to SAAS/PAAS outsourcing alone, or also to a hosted cloud solution. I’d be interested in seeing what large-scale cloud-hosted Moodle solutions are available – though it seems Northampton and Glasgow Caledonian both use Blackboard so their outsourced solutions are less interesting to me. multimedia support staff and academics. In a team of two (rapidly expanding to four and a fifth due for mid-way through next year) I’m very interested in the size and make-up of other TEL teams. Over my career these have varied and I recognise there isn’t a one-size-fits-all solution, rather that different organisations have different needs. I’ll confess to a bit of bias that the teams I’ve been in haven’t been staffed and supported as strongly as I would have hoped – hopefully the increasing buy-in by senior management will fix that! The 2014 TEL Survey results confirm that there has been little change in the delivery of fully online courses, which remain a niche activity across the sector. As I’m involved in a lot of distance learning it is pleasing (from a competition perspective) that we don’t have more of it. It would be interesting to see how UCISA’s survey results change when factoring in the various private educational providers that do have more of an online presence. This isn’t going to turn into another rant about how frustrating Moodle 2 is … honest! Rather let’s instead take the position that any web-page that hasn’t been custom designed for a specific individual will always, no matter how good it is, leave something to be desired. This, for me, is where greasemonkey comes in. So, there are things Moodle does that I wish it did slightly differently. So this is where greasemonkey comes in. I write some scripts to make it behave differently for me. As with backups, I want reset to use my defaults, so a script does this for me too. When searching for users in Moodle the default filter is the user full name, with other fields hidden. When showing the other fields there are so many it obscures the ones I want (email and username). A tiny bit of scripting and application of some CSS rules, and now the default shown filters include email and username. When students submit assignments the assignment submission box lists their names, with their files etc. It does not list some of their other more useful profile fields. For handy user identification we populate the field ‘department’ via ldap with student ID numbers. Unfortunately this field is near invisible in the VLE and not much use. This isn’t fast, as each new cell requires an ajax call pulling back a whole page of Moodle (slow), and then stripping it down to the bit we want. But this is a darn sight faster than copy/pasting what’s on the screen, dumping into a spreadsheet, and then manually looking up student numbers and hoping you don’t have two students in the same course with the same name. This is rather trivial, it just changes the URL replacing ‘course/view’ with ‘backup/backup’. So for the URL https://subdomain.domain.ac.uk/course/view.php?id=192 it takes me to https://subdomain.domain.ac.uk/course/view.php?id=192 which is of course the exact right place for taking a backup. I use a similar bookmarklet script for Moodle course resets. With over ten Moodle 1.9. * installations that all need upgrading, the next few months are going to be exciting. I have a clean Moodle 2 install, and a test 1.9 -> 2.1 install, and have been frustrated by some of the changes. I should note that I am also pleased at other changes, but those things I like will get less air-time than those I don’t, ’tis the way of things. I have not fully understood how these differ from Moodle 1.9 yet, though I am assured they do. Firstly, site-wide and category enrolments do not work the same – I’m not quite clear yet exactly how. There is a new enrolment plugin type called ‘Category enrolments’ that seems to be involved that supposedly restores old behaviour if enabled. This interacts with the new capability ‘category:synchronised’. I believe this specifically synchronises roles at a category down into a course level. I believe it does this as a proper enrolment rather than as an ‘other user’. What I don’t like about this is that it has changed, I don’t understand it fully, and it becomes difficult for me to ensure desired pre-existing behaviour is maintained. Another thing that annoys me, is the removal of ‘hidden’ role assignments, replacing them instead with the concept of ‘other users’ in a course that will have access but not be listed as a participant. On face value this seems to make sense, but one of the way we used to use ‘hidden’ enrolments was when enrolling site-wide users. We would set someone up with Teacher permissions site-wide, and to prevent them showing up as being a Teacher on every course we’d set the role as hidden. If someone needs site-wide permission levels there is no way to do this as an ‘other user’. Where this Teacher role is granted site-wide because there is no ‘hidden’ option, that person is then listed on every course as a Teacher. A solution is to tweak ‘course contacts’ so that Teachers aren’t listed as Teachers of a course, or better to duplicate the Teacher role and make sure they aren’t a ‘course contact’. Where multiple roles are used in both visible and hidden ways, this means duplicating those roles and them essentially being identical in ALL WAYS except for which are listed as ‘course contacts’. These roles may then be synchronised back down into courses if ‘Category enrolments’ and the ‘category:synchronised’ capability are enabled. I could easily see this then requiring even more duplicate roles. In a course when I view enrolled users (course administration->users->enrolled users), I can choose to filter by enrolment method, but not by role. Ditto for ‘other users’. It isn’t easy to get a quick look at who is enrolled as a Teacher. For this functionality I specifically have to use the Participants link in the People block – which doesn’t show up ‘other users’ anyway. I can click on ‘enrol users’ to get the traditional side-by-side view of those enrolled and not enrolled. But (1) there is not a separate view per role, (2) if there are ‘too many users to show’ you’re out of luck. This is one of my largest frustrations. In Moodle 1.9 we had a the following workflow. Within an ‘all course materials’ course we would ‘display a directory’ that allowed students to navigate the neat folder hierarchy and access the hundreds of course files. Because these files are synched when updated, we never need to go into Moodle and delete old files and replace with new ones. Moodle 2 have changed the way files are handled. Repositories are a new and ‘good’ way to handle files in Moodle 2. As a consequence to the ‘new way of doing things’ the ‘display a directory’ resource. This has been replaced by a ‘folder’ resource. When creating a ‘folder’ resource there is no way to point it to a folder within a repository. If all your hundreds of files from the server sit in a file-system repository, you can one-by-one add the files to your course ‘folder’, but not in bulk. Once a file is placed in your folder from the repository it is replicated into Moodle’s database. Presumably if the original file in the repository updates, nothing happens to Moodle’s database copy, and so every time a file is updated, you need to go into the ‘folder’ to remove the old one, and add the updated one. What is the point of a repository if we can not update documents in there, and know that Moodle is picking up the update? What is the point of a ‘folder’ if we can’t bulk select files from the repository? And no, adding zipfiles and unzipping them into the folder is NOT a suitable alternative. Yesterday saw the first upgrade of the first of our live installs, and there were mixed results. More ‘folder’ frustration as it turned out that in my fresh M2 install, my test M2 upgrade, and the live M2 upgrade that the capability ‘folder:view’ is not set to ‘allow’ for students. What does this mean? It means that the ‘folder’ resource, presumably intended for students, is not actually visible to students! I don’t know if this is a default Moodle 2 setting, or just something wrong at our end – but it certainly got me kicking, screaming, and pulling my hair out about folders all over again! Going back to my frustration with site-wide and category enrolments, imagine my frustration when everyone with our ‘College Admin’ role (site wide) who had previously been able to see all courses, was suddenly unable to see any courses! It turned out that this was because their role did not have the ‘course:view’ capability. In our other 1.9 installs this role does have this capability, so either something took it off in the upgrade or this one install didn’t have it set (I don’t believe this!). While I am pleased at some of the new features (cohorts!) of Moodle 2 I am really disappointed in the loss of some Moodle 1.9 features. Following on from my last blog post, I am responding to connect.me’s call to blog about those I trust. One aspect I think that could do with some improvement in the way connect.me handles vouches, is the lack of evidence associated with each vouch. I hope I am trusted that when I vouch for someone in ‘photography’ it truly means I respect and value their photographic skills, but beyond that how do you judge that relationship? I would like the ability for each vouch to have an optional description field which is not shown by default, but that can be displayed as and when needed. This might serve a little like ebay feedback (which is another form of reputational currency). Until there is such an option, I find this idea of blogging about who and why I have trust vouched an ideal way to explain my choices. Richard Bellingham – My first and greatest friend from University (undergraduate years). I have known Richard for many years and he is a thorough geek. I credit long nights of conversation with me for his rationalist and atheist views – though it may be fairer to note that questioning everything and re-evaluating one’s views is a natural consequence for an intelligent person leaving home and going to University. I have read some of what he was written, though as a writer some of his favoured genres (that’s something you’ll have to ask him about) don’t always appeal to me. For many years I have role-played under him as a games master, and have enjoyed myself thoroughly. He has his own style of running games, perhaps expecting too much player-led activity for the likes of some, but is far less rail-roading than others. We both studied Biosciences together, and then we both went different ways to do Masters degrees in Computing. With programming being a fond love for both of us I would much have preferred our University days to have been swapped – though I have fond memories of his early forays as a multi-threaded java programmer mixing up .run() and .start() methods. Rhodri Broadbent (not yet signed up) – My greatest friend from my University (postgraduate years). I remember many afternoons and evenings spent at his house playing games on his Nintendo gamecube. More fondly still I remember the summer where I had my mum’s house to myself, and Rhod stayed over so we could both work intensively on our dissertation programming projects. Days and days spent programming in separate rooms, only to go through to pester the other while musing aloud on whatever the current bug was. Evenings playing Counterstrike and watching Invader Zim may have been the only things to keep us sane. Rhod’s project was a 3D game of a bird flying down an obstacle course shooting at things. Since then he has moved to Japan, working as a real games developer, and now is back in the UK with his own games company DakkoDakko. Steve Bailey – I have worked (Uni of Kent) with Steve for several years and regard him as my friend. However I’m including him here under professional rather than social as my vouches for him are more professionally oriented. Steve and I worked closely together in learning technology. The majority of our work revolved around the open source VLE/LMS Moodle – but Steve’s interests and skills go beyond this and include lecture recording, education generally, and explain why he is an excellent educational technologist. Mick Norman – Mick is another one of my former Unikent learning technology colleagues. I worked with him for almost as long as I have worked with Steve. I regard Mick as an expert in the use of Moodle and a wide range of other educational technologies. Mick is an avid musician and participates in orchestras and bands – though where he finds the time, I do not know! He is also a keen photographer and I am hoping to pick up some tips from him soon, perhaps over beer. Daniel Clark – Dan is the final former Unikent colleague to make it to this list. At the time of this post the three of them are still colleagues at Unikent and I miss being their colleague nearly daily. Dan has a background in music technology, works in educational technology, as well as having broader qualifications in education. Dan is another avid photographer and musician – which is quite good as I know that in a hostage situation if I ever have to choose between Dan and Mick I can guarantee I’ll be able to keep a musical photographic former-colleague/friend. It is good to have spares! Loz Kaye (not yet signed up) – As the current Leader of the Pirate Party UK Loz is an inspiration to me with how he can find the time to be in so many different places doing so many different things. He is far from a career politician, he is one of those rare people that sees something he disagrees with and instead of sitting back grumbling about it, he takes a stand. Following him on twitter is sometimes a whirlwind-like experience as he discussed pirate politics, music composition, and various things in foreign languages I can barely comprehend. I know the PPUK is better for his involvement, and I am proud to vouch my trust in him. Andy Halsall – Andy is another person that I am fortunate to have met through our mutual involvement in pirate politics. He is a dedicated activist who is currently the Campaigns Manager of the Pirate Party UK. I am impressed with how much he can get done, and how well he sometimes manages to delegate. I live in fear of his phone calls and emails asking me to do things … well perhaps not fear, but he’s just so difficult to say no to! Harley Faggetter – Harley is the third member (in a row!) of the PPUK National Executive Committee to make it to this list. Out of all ten listed I’ve known Harley the least amount of time, yet it has been enough to know he is dedicated to pirate politics. I have spent many an evening in Parliament attending a debate sitting alongside Harley, whispering comments and opinions back and forth or comparing tweets. Jack Allnutt (not yet signed up) – Jack and I have both held similar roles within PPUK. We were both elected into positions of Regional Administrative Officer and onto the Board of Governors at the same times as each other. I have got to know Jack well while working with him and know he is enthusiastic about pirate politics and making a difference. Will Tovey (not yet signed up) – Will is one of my colleagues on the PPUK Board of Governors. He impresses me regularly not just with his interest in pirate politics but also with how ready he is to dig into boring, verbose, dense legal matters to summarise and make sense. Perhaps this shouldn’t be too surprising as he is a law student, yet it is incredibly helpful. I don’t know exactly how high his reading stack is, but I get the impression that things get added to it faster than they are taken away. That Will keeps on going is a testament to his willpower. I have recently joined connect.me, a new reputation network. I have been asked why, with all the other social network sites available, did I join (and pester friends/colleagues to join) this one. Firstly a reputation network is NOT a social network, well, not exactly. A dedicated reputation network would seek not to compete with other social networks, but instead provide a mechanism by which one proves one’s credibility. That proof can then be used in other places (social networks being one example) to support and evidence your reputation. For example, if you were on a reputation network and had many vouches that you were eminent in the field of network security, you then might post a blog article about network security. Your readers may want to know if you’re talking nonsense or not and can check to see what your reputation is by following a link to your connect.me profile. What’s more they should be able to see who vouched for you, and determine for themselves how reliable those vouches were. If a bunch of other network security people had vouched for you, your readers could trust your blog article more than if you only had vouches from your luddite grandmother. Why *this* one? Why not? If it fails to work, I can delete my account. If it ends up being successful, then I’ll make use of it. However such systems only work when they are used. If no-one that knows me is on there, my reputation can not be accurately judged by those that don’t know me. Hence I encourage to join those that know me in particular fields of my interest. When you considers online services such as this the immediate concern is privacy, what they do with your data and how they respect your rights to privacy. This site has won an award for their personal data privacy policies. What this means further down the line, any site can change policies, is debatable. Therefore it is important to keep telling them how we value their current stance to ensure they stick with it. While adding some custom code into Mahara, I came across what seems like a very odd PHP bug today, so odd that I put it down to user error, but just can’t seem to find what the user error is! Imagine the code below with some embed code from youtube or picasa as the value of $embedCode. The line that plays up is the one including setAttribute(“style”, “max-width:100%”). It works on pretty much all other possible css values, but doesn’t seem to like max-width nor min-width. I can set the style to hold color or background values, or text-align, but not max-width! What gives? Why does PHP seem to have CSS max-width? EDIT: I have since uncovered the cause of this. My text string was being passed through a Mahara function clean_html() which strips out various things, including max-width style definitions. The solution is to clean_html() before I apply my max-width and hey presto, everything works as expected. If you haven’t heard about it, and that’s ok as it’s still really new, flattr is a social micro-payment service. In simple terms it provides a means for creative individuals to receive payment from fans of their creations, although in practice the flattr system is far from being a conventional form of payment. As a user of flattr (I just signed up today) I am expected to pay at least 2 euros a month into my ‘for flattring’ account. During the month I am free to ‘flattr’ as many other people’s work as I like by clicking on icons such the following. At the end of the month my 2 euros is divided evenly between all the people whose work I flattrd that month. If I haven’t flattrd anyone, my money goes to charity. If I haven’t paid in my 2 euros, none of my work can be flattrd. At the moment, with a limited membership and invites required in order to sign-up, the amount of content available for me to flattr seems uninspiring. That said I have attached some of my own content (stories, political blog posts, diy composting wormery instructions) which I am hoping will sufficiently inspire others to get back some of the money that they system will inevitably make me spend. As a principle, social micro-payments plays perfectly with the notion of free culture. It provides a much-needed reward mechanism that can rest alongside freely distributed under, for example, creative commons licences. To learn more, please visit the flattr.com website, and perhaps even watch a video (in English) with one of the flattr founders. Once registration is thrown open to all, and if the system gets enough users to become mainstream, we can regularly expect many of our favourite websites to add flattr icons along with the rest of their social links. Then, and only then, when there is sufficient content that actually has sufficient value to me that I want to reward it, will I feel comfortable that my 2 euros a month is going to worthy destinations. If you’ve been hiding under a rock all week, or been internet-less at home (like I have) you may not have heard about Google Buzz. To learn more, you may wish to read Google’s official introduction of their latest service/product. If not, we’ll give you an executive summary. 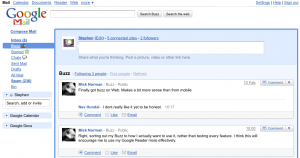 Google Buzz is a feature built into Gmail that provides a social networking service that is a Facebook/Twitter hybrid. Buzz leverages existing Google services (Picasa, Blogger, Reader, Google Chat) as well as other 3rd party services (Flickr, Twitter) to try and pull all your internet activity into a single information stream for you to share. 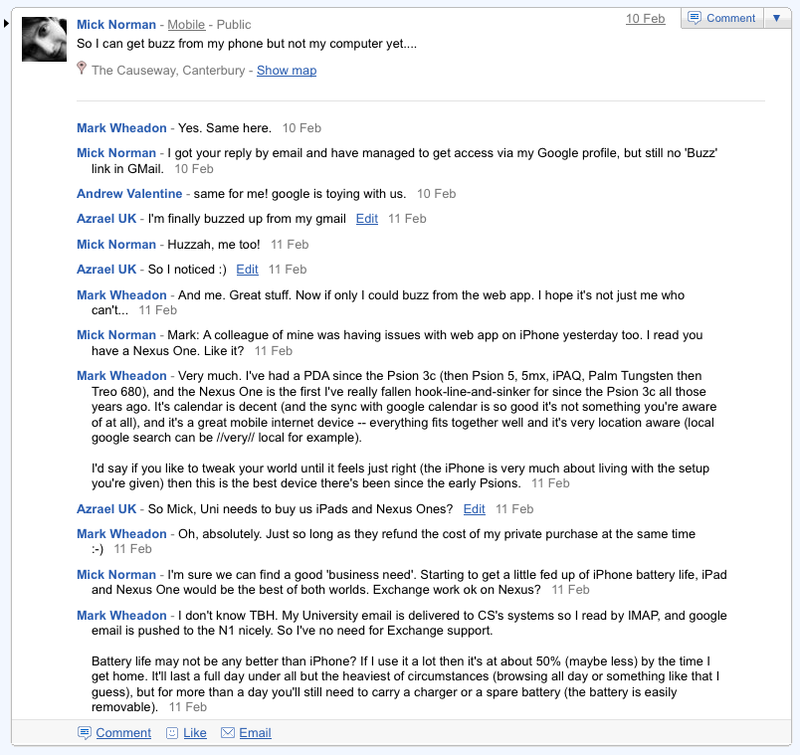 The basic Buzz view is very much like Twitter (actually more like Jaiku – a Twitter clone), allowing the user to post status messages which others can comment on. However by pulling in images from Flickr, posts from Blogger, etc the visual experience of your followers becomes much more like Facebook. Above we see the basic Buzz view showing some of the status updates of people I am following. 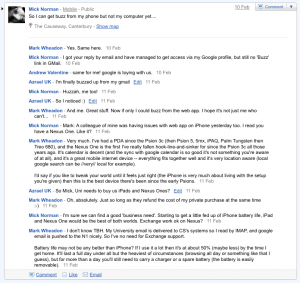 Unlike Twitter, and more like Facebook, each status message can be commented on to create a conversation (shown above) which is visually rather similar to Google Wave. 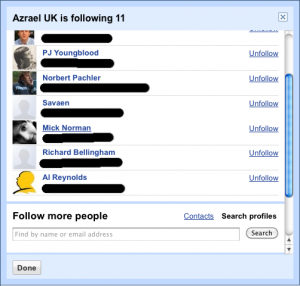 You can easily list those you are following, as well as search for other users to follow. Google automatically suggests other gmail users in your address book as possible users to follow. When activating Buzz you are required to put some information into a public profile. Above we see a smple Google Buzz profile page contents. It’s fairly clear that Google are trying to take the best features of Twitter and Facebook to create a product that will compete with both. After the mixed response (so far) to Google Wave it is a very smart move to tie Buzz into an existing and highly popular service (Gmail). As a non-revolutionary communication tool (as Google would like you to think Wave is) it seems like a natural fit to embed Buzz as an extension to Gmail, in very much the same way as Google Talk was. The immediate benefit of this is to leverage an existing user base (Gmail users) rather than having to rely on hype and publicity to grow a stand-alone social networking tool – just take a look at the failure (unless you’re in Brazil or India) of Orkut. It’s difficult to predict how well Buzz will compete with Twitter or Facebook, but it is interesting to note that you can have Buzz automatically pull your public Twitter status updates into it but that there is no tie-in with Facebook. Does that signify that Buzz is more aimed at replacing Facebook, or a subtle attempt to appeal to existing Twitter users and eventually wean them from status updates in Buzz via Twitter to more direct use of Buzz as a replacement for Twitter? As a replacement for Facebook the one thing Buzz is lacking is the many 3rd party applications which appeal to so many (not me!). However 3rd party gadgets is a feature present in iGoogle. There is not yet a Buzz gadget for iGoogle, however when (if?) there is it might be a significant step towards taking on Facebook. Google’s OpenSocial API is very significant factor to both Buzz and Google’s intentions. By providing free and open social networking APIs Google are making it possible for communication between any social networking service that wants to use them. This allows for Buzz to pull in Twitter streams, but at the same time, in principle, allows for the reverse. Buzz does not have to compete with and ‘kill’ alternative social networking applications to be successful. In fact the Google approach seems to be to ensure that they are an integral part of the genre, rather than kill off and replace competitors. The idea solution to Google (in my opinion) is for a social networking landscape that is open, searchable, and interoperable (let’s not forget that Google make their money by search). As a regular Twitter user, and an irregular Facebook user I am looking at Buzz with interest. I do have a Gmail account, but I do not use the web-interface to it on a regular basis (I use desktop email clients to access my Gmail), and this is to me the first limiting factor with Buzz. If I was always on my Gmail (via the web) then I would suddenly and automatically be always on my Buzz. But I am not, and I find it difficult to add a new routine to my already busy days. If something like TweetDeck (3rd party application with support for posting Twitter and Facebook status updates simultaneously) gains Buzz support, then I would immediately be able to embrace Buzz without adding any significant overhead to my daily activities. Summary: Yes, but not all that much right now. What does Buzz need to make me use it? I find my views to be rather contradictory. I think Buzz is going to be a success due to how closely it is tied in to Gmail. At the same time I do not think I will use Buzz very often specifically because it is tied into Gmail. In the same way that I tweet via 3rd party apps, the success of Buzz, for me, lies in it being embraced by the same 3rd party apps that now support Twitter. Fortunately, as Buzz is built on Google’s own OpenSocial APIs, this is entirely possible, and in my opinion probable. No. I’m waiting for OneSocialWeb. Will Google Buzz be successful? Probably. For your average internet user it will just become part of their routine to check Buzz at the same time as they check their email inbox, especially if they suffer from the same compulsion as I do to get rid of the unread count as quickly as possible. It will be come part of a person’s daily e-routine: Check email, check Buzz, check Facebook. Will Google Buzz overtake Twitter and Facebook? No. It’s a different tool. 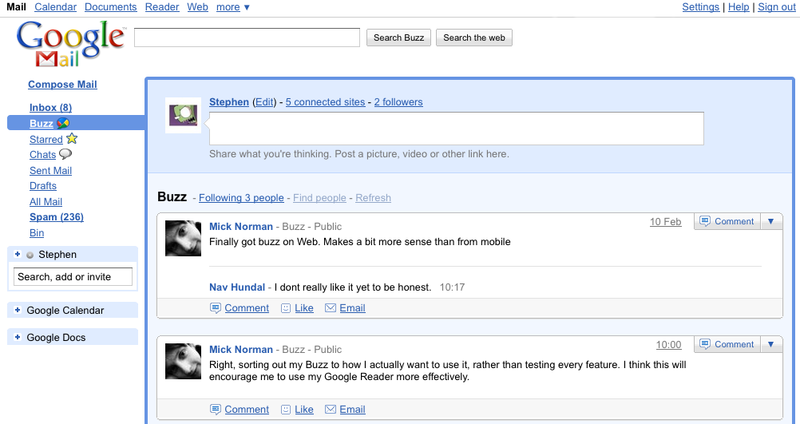 Just like Twitter is a different social tool to Facebook, Google Buzz is different to Twitter and Facebook. Admittedly Buzz is closer to Twitter than Facebook, but I still don’t see it taking over the social networking world. It may become as popular as other social media tools, but it’s unlikely to replace them. My reasoning? Lets compare Buzz with Twitter for example. Twitter posts (tweets) are restricted to 140 characters which keeps things nice and concise. I use Twitter to keep up with Learning Technologists and technology blogs from around the world. I can easily scan down a list of the last few hours activity quickly and easily, taking in what I’m interested in and glancing over what I’m not. With Buzz, that’s not so easy. The lack of character limit means that posts can be quite long and to be honest, once it gets longer than 140 characters, I probably won’t bother reading it at all. Couple that with the long list of comments per Buzz you get on people’s profiles like Mashable and Stephen Fry‘s and the ability to scan through your follow list in 30 seconds to get a quick update on what people are posting is lost. Will I use Google Buzz? Yes. Partly because I feel like I should keep up with Buzz as it develops and partly because some of my friends will use it who currently do not use Twitter. However, I won’t use it as often or as extensively as I use Facebook or Twitter, but I will have a look at least once a day. This is largely due to my GMail account not being my primary personal email account which means that I do not check it as often. If Google Apps roll out Buzz on my domain then I might start using it more, but only if I can tie in my existing web profile. Don’t get me wrong, I like the idea of Buzz and I particularly like the ability to comment on people’s posts. For me, however, it’s arrived on the scene a bit too late for me to make it my primary social media outlet. I’m already heavily invested in both Twitter and Facebook and don’t really have the time to become as invested in Google Buzz. “But you can link your Twitter account to Buzz” I hear you cry. I can, but I don’t want to. Most of the people who follow me on Buzz follow me on Twitter and for my Buzz profile to be in anyway effective or useful to me and others I need to avoid duplicating my posts as much as possible. The upshot of this, of course, is that some of my followers on Twitter will miss out on things I Buzz, and vice versa, but that’s no different to the distinction I have between my Twitter posts and my Facebook posts. Is Buzz a halfway-house to Wave? The interface is quite similar which leads me to wonder whether Google are playing a little mind game with us to encourage us to give Wave another go. Or will Buzz ultimately become an integrated part of Wave as well? I’m not sure, but I know that if Buzz has been part of Wave from the outset, I might have found Wave a lot more useful. Having recently read the 2010 Horizon Report Preview we decided to publish our response to some of the points it made. This report preview is divided into five sections, the first three of which cover a range of different time-to-adoption horizons. Within the One Year or Less section there are two areas which generate strongly different repsonses from us. Tools for study, productivity, task management, and more have become integrated into a single device that we grab along with car keys and wallet … It is easier than ever before to remain connected anytime and anywhere. As far as Mobile Computing is concerned, we very much agree with the report. We do not, however, share the same optimism for the adoption-time of Open Content. Open content is a growing movement that focuses on sharing and reusability and thrives on the ready availability of a wide range of educational content. There are currently so few institutions actively engaging with the production and use of open content that we do not feel the necessary amount of education content will be available within such a short time frame as One Year or Less to make Open Content mainstream. As a result, the role of the teacher is undergoing a slow but definite change, from the guardian and dispenser of knowledge to the guide and coach for learners faced with an overabundance of resources. Whilst we agree that the role of teachers will have to change, transitioning from ‘guardian[s] and dispenser[s] of knowledge’ to ‘guide[s] and coach[es] for learners’, we are not confident of this happening quickly. The nature of education is such that academics are already starting to move from guardians of knowledge to guides and coaches for learners but without further development of this culture the adoption of open content will be seriously impacted. One question worth considering is that once our teachers become guides and coaches rather than fountains of knowledge, who will be the authors of new educational open content? Will there be a wider academic divide between those that teach and those that research? Where is the incentive for research academics to publish open content in a format that is suitable for new undergraduate learners? On the flipside can universities afford not to publish their resources as open content? Will HE recognition rely on the resources produced as much as the quality of teaching and research and peer reviewed publishing? Open Content is a threat to the traditional journal publishing model, so how will journals react? With the upcoming REF to be partially based on citation metrics, is this a good time for Universities to be challenging the publishing establishment? We seem to have more questions than answers, so we leave it to you the reader to answer for us. Comment below! Back in May we announced that as part of our successful Challenge Fund bid we’d be running an investigation into low-cost, scaleable lecture recording scenarios. Before we can begin this project we need to collect some data on lectures in general, so we’ve created a short survey. The survey asks questions about the type of technology and content you use in lectures, and what your lecturing “style” is. These questions will help to inform the types of technology that we use in the project. At the end of the survey is a short form which you can use to volunteer to be part of the project, so if you’d like to try out some lecture recording techniques, and have a module running in January, then remember to fill this in. We’d ideally like a good cross section of lecturers with differing levels of computer literacy, so feel free to volunteer even if you’re not comfortable with technology. Our survey will take no more than five minutes to complete, so please help us out by filling it in now.